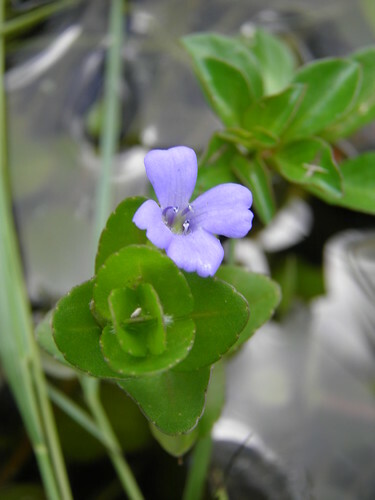 Keep an eye out for this blue-flowering Bacopa in wet areas, and if you find some, make a note where you did, as it is not always easy to find. 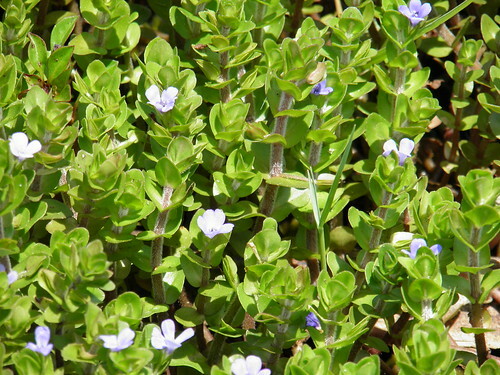 Note that Florida's most common other Bacopa species, the unscented Herb-of-Grace, Bacopa monnieri, has white flowers, not blue like Lemon Bacopa. The crushed fresh leaves of Lemon Bacopa emit a strong scent of fresh limes. The flavor is similar to limes as well. I very much enjoy a simple ten minute infused tea made from the fresh leaves. This tea may relax your nerves, as it contains compounds proven to do so. This species is host to the White Peacock Butterfly, which may be observed laying its eggs on the leaves. Oh, one more thing... the blue flowers are delicately fragrant. CAUTION: webmd gives warnings against the ingestion of the closely related Bacopa monnieri, so I will list them here in case Bacopa caroliniana has similar effects. Avoid if you are brest-feeding, have a slow heart rate [bradycardia], gastrointestinal tract blockage, ulcers, lung conditions, thyroid disorders, urinary tract obstruction. 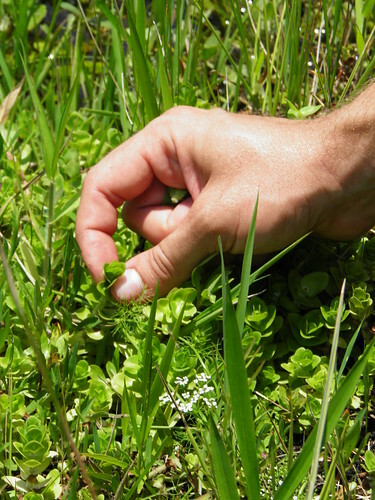 EDIBLE LEAVES: "Both species of Bacopa are considered edible and are used in salads and as a seasoning by those with adventurous palates." Some websites, such as fishpondinfo.com, list it as a seasoning. They have the scent and flavor of fresh limes. - TEA: The leaf and flowering stem tea has the scent and flavor of limes. Although some of my wildcrafting friends dry this flowering herb for later use, I much prefer it when the leaves are used fresh. Crush one four inch stem well and pour boiling water onto it in a cup. Let sit for ten minutes – add some honey if you like… yummy! HARVEST TIME: All year. Freezes may harm the leaves. NATIVE TO: The southeastern US, Maryland, south to Texas to Florida. Within Florida, it occurs in most, if not all, counties. DESCRIPTION: An herbaceous, aquatic, short lived perennial  that sprawls along the ground, rising to 6 inches tall. Width: "Extensive mats." It lives, submerged, for periods of time as well. - LEAVES: Opposite, hairy/rough, almost round, thick, succulent. Small, less than 3/4 of an inch. - SCENT: The crushed leaves and stems have the scent of fresh pressed limes, not the often-listed scent of lemons, as most writers claim. The University of Florida describes it as having a "fragrance reminiscent of lemon, lime, anise, or licorice." I wouldn't go that far, and would simply describe it a lime-like. - FLOWERS: Blue, showy, five (sometimes 4 or 6) petals, fragrant, occasionally flowering below water (“though they soon rot.”). - BUTTERFLIES: This plant is the host for the White Peacock Butterfly. POTPOURII: The dried and chopped whole plant is added to potpouriis when a lime scent is desired. AQUARIUM & WATER PLANT: This plant is used in the aquarium trade and is planted in water gardens. FAMILY CLASSIFICATION: This species has formerly been classified as being within the Figwort family, Scrophulariaceae. 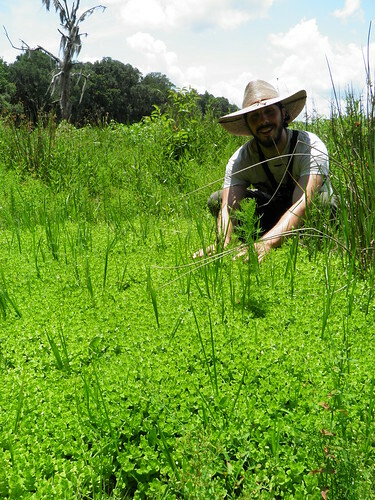 Currently, sources such as the Atlas of Florida Vascular Plants, the Florida Native Plant Society, and theplantlist.org, place it within the Plantain family, Plantaginaceae. The USDA, however, places it within Scrophularuaceae. 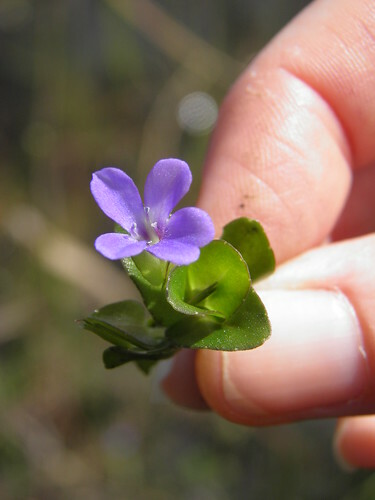 RELATED SPECIES: Bacopa monnieri, the Herb of Grace (known in India as Brahmi), also grows wild across Florida. It has white flowers, no lime scent, and is much more common. It has been used for thousands of years in Ayurvedic medicine to help with memory and such. - HARDINESS: USDA zones 6 - 9. I observe it growing across zone 10 here in Florida. A number of native plant nurseries statewide carry this species. 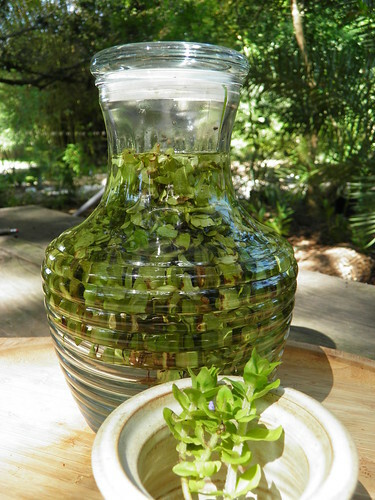 The University of Florida writes, "Lemon Bacopa is widely available from a variety of sources, including stores that carry aquarium plants, water garden supply shops, and nurseries that sell aquatic or native plants."